This page shows how to add a link to SiteBar using Firefox extension. 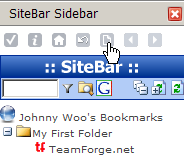 See SiteBar Integration into Firefox for instructions how to install Firefox Extension. Check you are currently browsing the Web using Firefox. Press Alt+Shift+D to open SiteBar sidebar. Hint: If Alt+Shift+D does not work for you, you might want to change SiteBar Client Preferences for keyboard shortcuts. You have to be logged in to SiteBar to access and manage favorites online. Click on the Add Page icon to add link to the currently displayed page. An Add Link dialog shown below will be displayed. Hint: As an equivalent you can also press Alt+Shift+A any time to bookmark online the currently displayed page, even without opening SiteBar sidebar. If Alt+Shift+A does not work for you, you might want to change SiteBar Client Preferences for keyboard shortcuts.